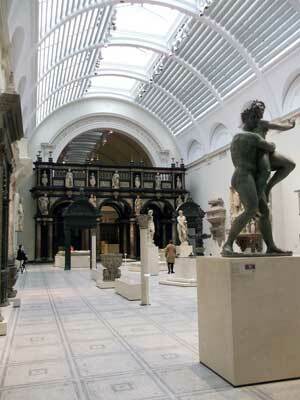 The Victoria and Albert Museum is by far the world's best museum for art and design. The museum was constructed after the great Exhibition in 1851 and contains items which cover a period of over 2000 years. It is housed in a stunning Victorian building which is absolutely huge. Because of its size you will need to plan your visit if you want to get the most from your day. It is simply impossible to see everything on one trip, I would even say that it could take many visits before you had a glimpse of all the different galleries. Every single item in the museum has its own unique story and incredible history, I don't think there is one item that you could call plain or basic. In my opinion this museum has to be one of the best in London and one that should definitely not be missed. Over the last decade the museum has undergone a massive redesign and upgrade which has improved the exhibition spaces to make every object easy to view and to stand out. They have not however gone the way of many other museums so you won't find many (if any) interactive screens or videos. This means that the items are left to tell their own story. This is a refreshing change and I think it benefits the visitors greatly, making this museum feel like a traditional museum while using the very best in modern design and lighting. Due to the size of this museum it is simply impossible to show you a sample of all the galleries, so instead I have chosen to pick out some objects from the collection to highlight, as well as a couple of the more famous galleries within the museum. I hope this will give you a flavour of what you can see during your visit. Because the museum is so large I would recommend that you join one of the free tours which last an hour. To find out when the next tour is starting simply go to the main entrance hall and either check the board at the meeting point or ask at the main desk. I decided to take the introductory tour which is designed to give you a taste of some of the fantastic objects on display. My tour was given by a man named Jeremy who was full of enthusiasm for the museum and the works on show and this enthusiasm soon rubbed off on all of us taking the tour. It was an hour well spent and I found out some fascinating information about a few of the items on display. 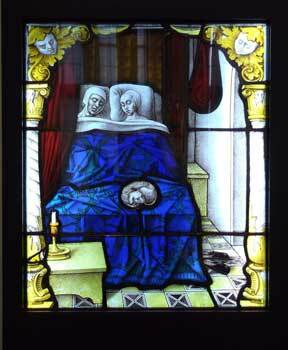 The Cast Rooms - Two rooms containing huge plaster casts of ancient and historical monuments and statues. 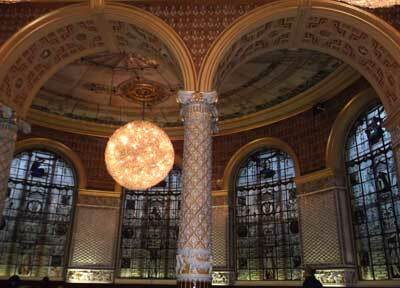 Paintings - The Victoria and Albert Museum has the largest collection of paintings in Britain. Displays include works by Raphael and Constable to name but a few. Medieval & Renaissance - Recently enlarged and improved, these galleries contain some of the most beautiful and important items from the era. The Victoria and Albert Museum was the first museum in London to allow their visitors to have a place where they could rest and have some light refreshment. The original refreshment rooms were designed by William Morris and Gamble and Poynter. The rooms are still in use today as the cafe which has now been added to extend the size. You really should visit the cafe, even if it is just for a cup of tea or coffee, because the rooms are simply stunning. But if you do require something more than just coffee you won't be disappointed as there is a large and varied menu on offer. Be warned, it's not cheap, but it is delicious. The museum boasts both a gift shop and dedicated bookshop and many visitors come just to buy gifts for friends and special occasions as there are some beautiful items available. There are items for everyone in the shop and the children are not left out either. It has to be one of the best museum shops for the variety of goods on offer.